Of the various promotional records containing radio spots which Chuck Berry recorded for companies and associations, one stands apart. 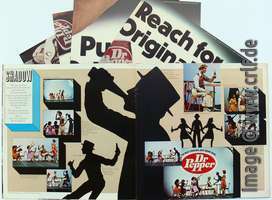 For the 1977 campaign promoting the Dr Pepper soft drink, Berry did not only provide an interview or a spoken advertisement. Here Berry and his guitar provide a full Rock and Roll version of that campaign’s advertising song. Quite recently, a video was uploaded to YouTube showing the recording of the song and the corresponding interview: https://www.youtube.com/watch?v=JgJfpexPfEc. Thanks to Anne Chanu for finding it! 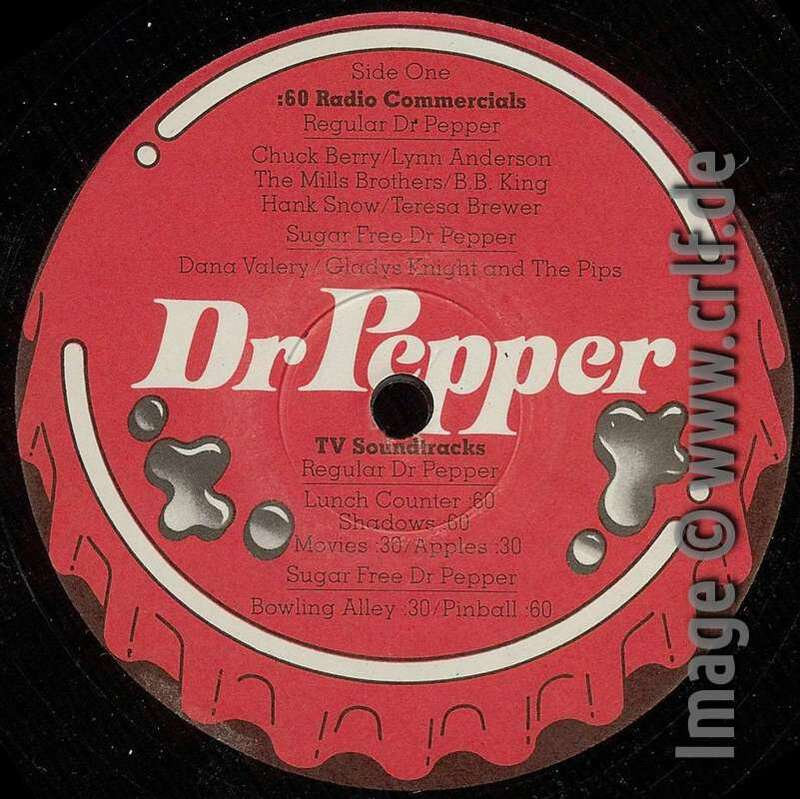 The video is interesting, but even more interesting is a note in the video description which points to a book written by Susan Hamilton who was the producer of the Dr Pepper spots and also of this Chuck Berry song. 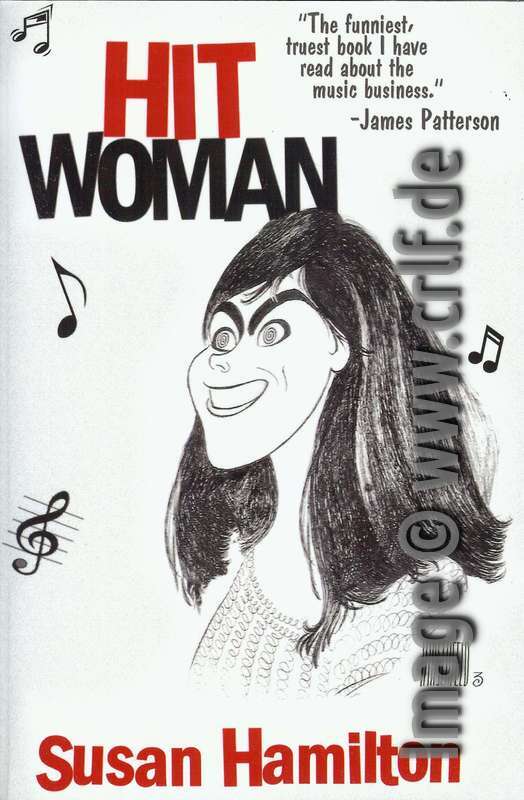 I bought and read the book, which is called “Hit Woman”. So should you. It’s an interesting and funny read about a segment of the music industry you usually don’t hear much about. Susan Hamilton was the owner of HEA Production in New York, one of the top advertising music production companies (also known as a “jingle house”) in the US. You can read a short bio at susanhamilton.com, but you better read the full book. 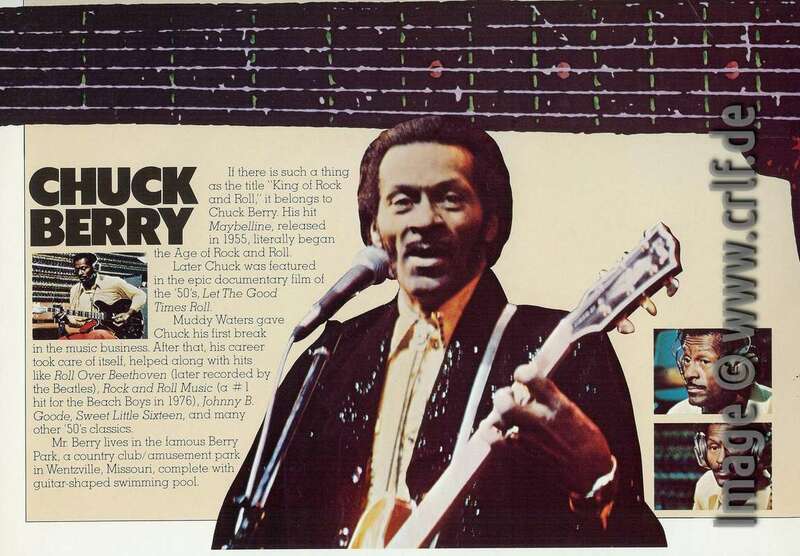 Video and book made me write this blog post about one of the rarest Chuck Berry records ever. 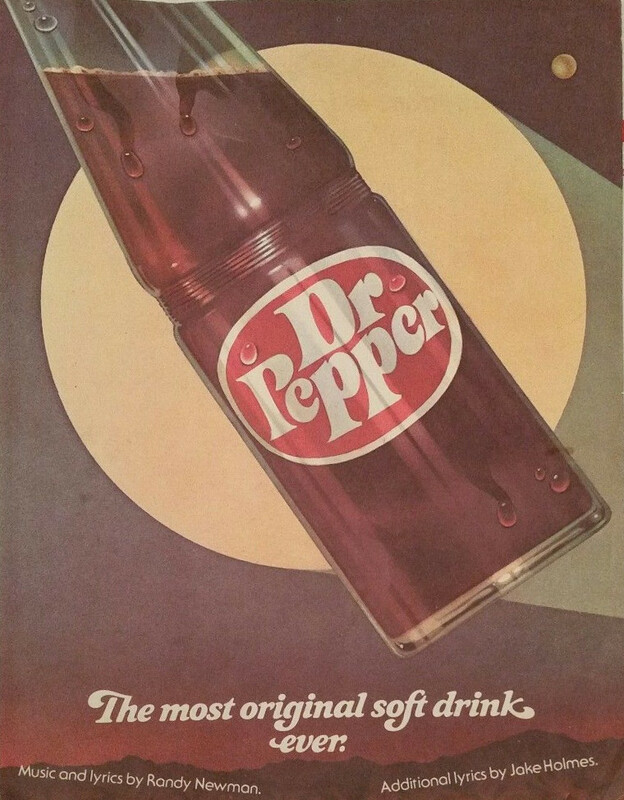 It all started when the Dr Pepper company and their advertising agency Young & Rubicam came up with a new campaign called “The Most Original Soft Drink”. It’s not quite clear when, but it must have been in late 1973, early 1974 when HEA Productions was contracted to create the music for this campaign. Through HEA founder Herman Edel and NY attorney Lee Eastman, HEA hired Eastman’s son-in-law to write the song: Paul McCartney. Susan Hamilton recalls meeting Paul and Linda McCartney in Los Angeles to discuss the project with the client and agency. To everyone’s surprise McCartney was not interested at all in learning about the planned campaign. Instead he told them that he had already written the song needed and played a cassette with a demo recording. This song was simply done; it was classic McCartney; it had a great hook, but it had absolutely nothing to do with our campaign. There was no relevance to all of the spots that have been tailored for the campaign – the precious campaign that had been worked on for months and (more importantly) sold to the client. McCartney refused to come up with something else and so Susan Hamilton was left finding a different composer within very short time. 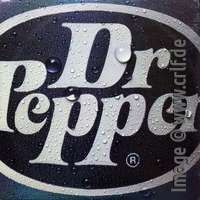 Through Tim Newman who worked for Young & Rubicam she got into contact with his cousin who agreed to write the jingle. The new composer was famous singer-songwriter Randy Newman who came up with the melody and lyrics for “The Most Original Soft Drink Ever”. For the radio spots, Susan Hamilton recorded the same song in various musical styles using a number of well-known artists. All these recordings were made over a few months in the fall of 1974. Bernie [Drayton] had to sit next to Muddy on a piano bench and whisper-feed him the words just before he spoke/sang the lyrics. The choruses were fine, but the word “originality” in the verse was mangled almost beyond recognition. Eliot [Scheiner] and I ended up piecing it together, syllable by syllable. Further recordings seem to have stayed in the can and were used for a later campaign in 1977. 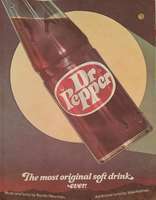 Artists selected then were Teresa Brewer, Hank Snow, B. B. King, the Mills Brothers, Lynn Anderson, and Chuck Berry. Again each performed the Newman/Holmes tune according to their specific style. According to Susan Hamilton, she recorded Chuck Berry probably in October 1974, just before they flew to Chicago to record Muddy Waters. The standard procedure was to record the base track in HEA’s own studio in Manhattan using a fixed set of very capable (and musically flexible) studio musicians. Susan Hamilton and her team then went to the featured artist and recorded solos and voice over the prerecorded track. Unusual for radio spots, but a film crew joined them in every studio to create a video of the recording and an interview with the artist. This is why we can see today how Berry performed the tune. The film was used only for promoting the artists and the campaign to Dr Pepper partners such as dealers or bottlers. 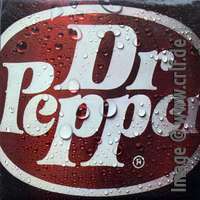 These partners were also the only recipients for the corresponding Dr Pepper promotional record given out at the kick-off convention. Very few of these promotional records seem to have survived. Even discogs.com misses it. Thus before we continue to learn about the crazy creation of this recording, let’s have a more detailed look at the beautiful record which this site's Morten Reff discovered in June 2012. 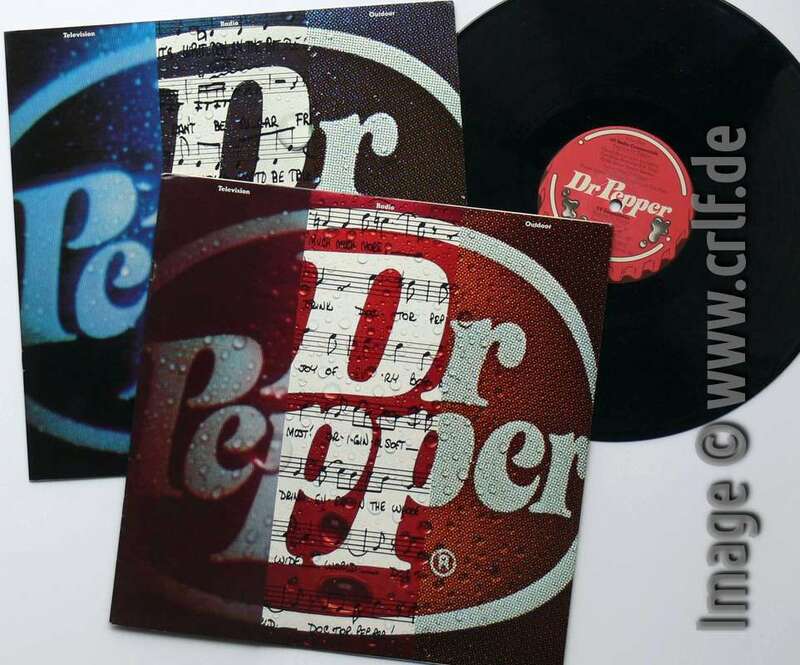 Besides a 12” LP there are two booklets, a red one for the Regular Dr Pepper campaign, a blue one for the Sugar Free Dr Pepper campaign. Likewise the LP has a red and a blue label. The contents can be seen in the two scans. Basically the red side contains the 60-second radio spots and the soundtracks of the TV spots, while the blue side has the soundtracks for the little films containing the interviews and session footage. 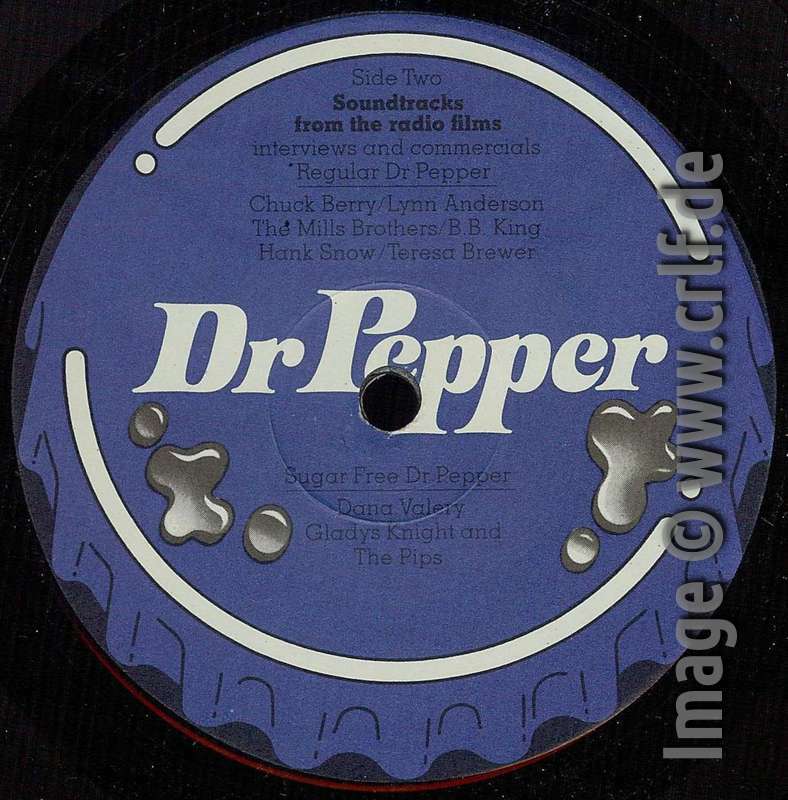 The Chuck Berry radio spot is at the beginning of the red side, the interview (followed by a count-in and the same song recording) is at the beginning of the blue side. The 16-page red booklet and the 12-page blue booklet each contain descriptions and photos of the TV spots, photos and some detail about the artists contracted for the radio spots plus separate reproductions of the outdoor advertisements. This is the segment about Chuck Berry which also includes photos taken from the film as shot during the recording session. All looks so perfect and in harmony. And this is in total contrast to what Susan Hamilton writes about this recording. Chapter 28 is only seven pages long, but it’s well worth buying the book just for this story. It all started when Hamilton, engineer Scheiner and HEA salesman Drayton flew to St. Louis with the agency’s Dennis Powers as well as cameraman Jim Desmond and his sound guy. The flight was late so they arrived close to midnight and tired. At the airport they were refused to get their rental cars until Chuck had a talk with the agent. Next they couldn’t sleep in a comfortable hotel in St. Louis but had to follow Berry for an hour by car to get to Berry Mansion, Summer Camp for Inner City Children – a dark, unlit wasteland of broken glass and cracked asphalt with no coffee, no showers, no food. In the morning they drove back to a broken-down studio of Berry’s in downtown St. Louis (not the Berry Park studios, seemingly), only to learn that Berry requested another $5000 for the recording. Susan Hamilton managed to get the approval from the agency and was forced to write a, in her mind non-binding anyway, contract on the back of empty envelopes. Finally they recorded the overdubs onto the track they brought with them. We got a bunch of takes and in a very short time. I knew I had plenty of material to be able to compile a great performance. Of course it was a little difficult to judge because we didn’t get to hear some of our previously recorded instruments. They just wouldn’t play from the 24 track machine through the broken faders. Oh well. We just imagined them. When the team was packing up in the afternoon, Berry demanded his money. He wanted the extra $5000, now and in cash. “You’re not leaving here until I get it. The tape is not leaving here, and your people ain’t leaving here, neither,” Berry said and locked people and tape in a back room. It was late on a Friday in St. Louis and Susan Hamilton had no chance to contact the New York agency nor the client. I picked up the phone and dialed my office. God was merciful, and someone was there. I had them wire the money out of our account to the Western Union facility in downtown St. Louis. I told them it was ransom money. I was serious. Eventually the money arrived, Susan got tape and people out of the back room after counting it out into Chuck’s hands. To top it, Berry forced them to go out with him for some soul food in one of the scariest parts of the town. The whole two-day Chuck experience was both hilarious and terrifying, as you can imagine – felt like I was in some dark comedy of a movie! Given this story, it’s no wonder we should be very suspicious watching the session footage on YouTube. The film shows Berry accompanied by session musicians on drums, bass, piano and sax. Look carefully and you will not find a single image where you see Berry together with one of the musicians. You can’t, because Susan Hamilton recorded Berry in St. Louis alone without a band. The prerecorded track had been made in New York already. I asked Susan if she can identify the session men from the video. She says that any shots in the film of musicians other than Chuck were added for creative interest by the film crew. These were not the original session men. It‘s fairly easy to see at the end where the film shows a sax player. There is no sax on the whole recording. Asked whether she remembers the original musicians, Susan tells that she can only guess. 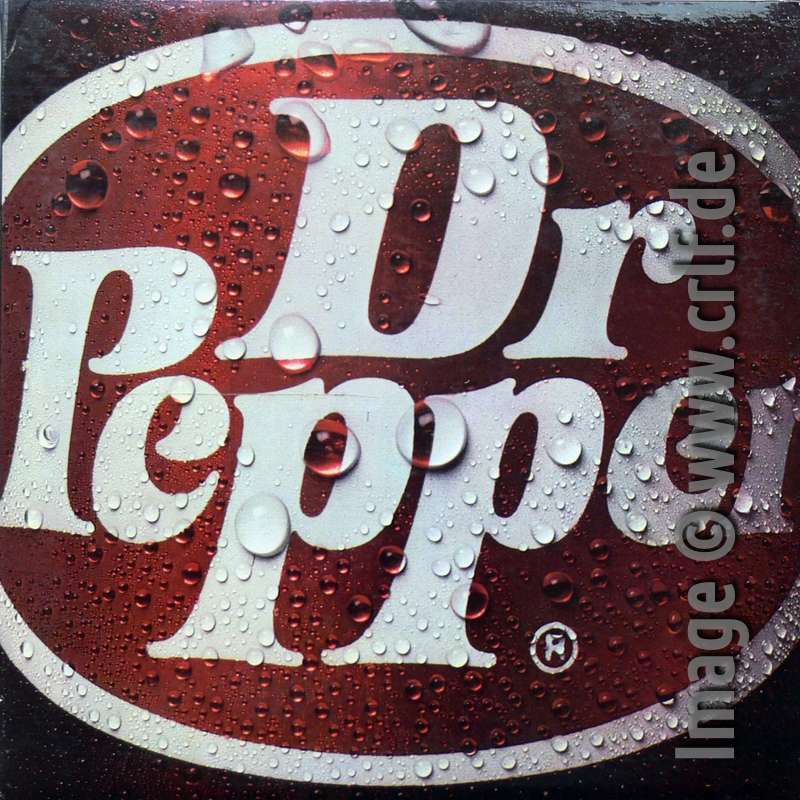 So despite the nice Dr Pepper video we are left with the unknown’s in our database. All quotes from Susan Hamilton have been taken from her excellent book “Hit Woman” (Hitwoman Publishing, 2013) and from emails in which Susan was so kind to answer my additional questions. Many thanks!